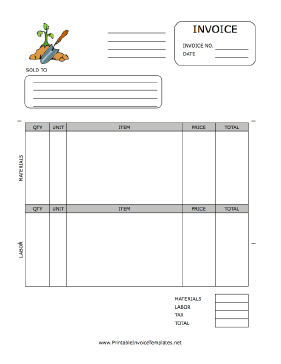 A printable invoice for use by a plant nursery, gardening shop, lawn service, or similar firm, or an expert gardener, featuring a full-color graphic of a mound of dirt and a green sprout. It has spaces to note quantity, unit, item, price, and more. It is available in PDF, DOC, or XLS (spreadsheet) format.